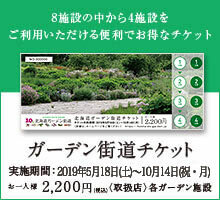 I got the following applications for "2016 Garden Treasure Hunt" from September 1st to October 1 6th 8 6th Wednesday. Thank you for applying for this garden over the garden in spite of the damage of the typhoon, although it was difficult for you to visit the garden this year. On November 1 9th, we got a lot of ecstatic selection and the following people won. We have shipped prizes on November 20th.